There was a time when headlights were made of glass. Those days are long gone. They are now made of hard plastics that are specifically tempered for the job. This material is known as polycarbonate plastic. It is very strong, but it also is naturally porous. To combat this, the manufacturer of your headlights covered them with a protective film. The film works well for a few years, but then starts to fall apart. Given the fact it is exposed to heat from the bulb, UV rays from constant exposure to the sun and harsh chemicals that come up off the road, it probably should not be a surprise that the film eventually fades. Regardless, this allows the plastic to become oxidized, which gives the headlights the foggy look. 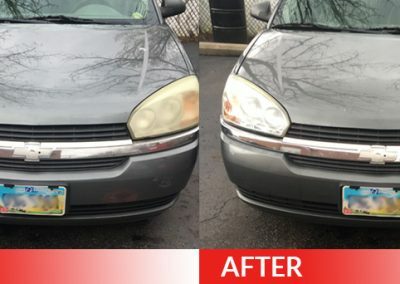 Dent Magic’s restoration process repairs any hazy, yellow or cloudy headlight. The key is to remove the damaged film and replace it with a protective coating that will return the headlight to its original condition. Each lens can take up to 15 minutes to repair. You don’t need to go out and spend hundreds of dollars on replacements if your headlights have become yellow, hazy or cloudy. 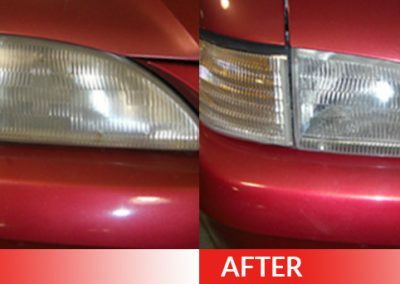 By using Dent Magic’s headlight polishing service you can spend a fraction of the price and have your headlights looking brand new in 15 minutes. Our proven process restores headlights back to their original look. We repair oxidized and cloudy headlights. You will save hundreds of dollars vs. replacement of new lenses. Our service is available on all makes and models.